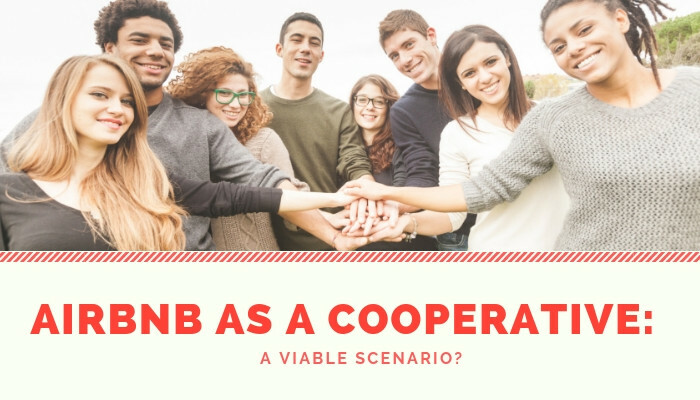 Airbnb as a cooperative: a viable scenario? In the midst of the tidal wave of discussions about the holiday rental website Airbnb, a highly remarkable message appeared on September 21st. In a letter addressed to the US Security and Exchange Commission (SEC), co-founder Brian Chesky shared his vision that Airbnb believes “that twenty-first century companies are most successful when the interests of all stakeholders are aligned.” Consecutively, he revealed the ambition to reward the platforms’ hosts with shareholdership. Such would allow them to profit from a successful IPO. Irrespective of the question whether this is part of a spin-doctored marketing initiative or Chesky & Co showing sincere intentions, he surely opened the door for a discussion on a new generation of sharing and gig economy platforms. Platforms like Airbnb, Booking.com, Uber and Facebook are marketplaces which in principle don’t own anything themselves. They make use of resources provided by the users of their platform. Although these users are indispensable for the creation of value of the platform, the profits of the platforms disappear in the pockets of the shareholders. Which, in most cases, are not the users. Moreover, the focus on maximizing shareholders’ profit forms an incentive to impair the users of the platform. Chesky’s plan is in line with a internationally growing desire for more equal models. His ideas aren’t completely new. In recent years, several experiments have been executed with so-called platform cooperatives. On such platforms users, mostly suppliers, unite themselves as a cooperative. They collaboratively invest in the technology on which they depend. Likewise, a group photographers owns and manages the stock photo website Stocksy, about 800 Denver-based taxi drivers started a local Uber-competitor under the name Green Taxi, and cooperative experiments of counterparts to Deliveroo and UberEats are rolling out in France. Although there are only a few successful platform cooperatives at hand, it is a soothing thought that platforms are faced with alternative possibilities. Chesky’s idea turns out not to be new, yet it is unique. Where many platform cooperatives start out as cooperative and are having a hard time to sufficiently scale up, Airbnb would finds itself in a reversed situation: the platform started as a commercially and centrally managed platform to be handed over into the hands of the users. Where many experts expect these kind of developments from start-ups using complicated blockchain technology, it is interesting –and disillusioning– that a two hundred year old model can also be found to be the solution. Alternative scenario: May it be a bit more ambitious? What if a hosts would receive the option to automatically exchange, say, 25 percent of his profit into stocks? Effectively, hosts could slowly acquire a growing share in the cooperative. With an average of 500.000 overnight stays per day for an average price of 80 dollar hosts could, calculating for the expected growth, pay up to 32 billion dollar over the next 10 years. The gross value of Airbnb nowadays. This would make the cooperative the sole owner of the platform. At the time the hosts become co-owner and co-manager of the platform by means of a cooperation, a better equilibrium in making decisions about the future and its place in society can be achieved. However, this is a first step, and also this model wouldn’t be perfect. The current focus on hosts and not on neighborhoods and cities has shown its dangerous sides when not all stakeholders are involved in the decision-making processes. Alternative platforms like FairBnB do try to involve all stakeholders, but they have a hard time getting established. All in all, we have to experiment with new ways of ownership and management models of platforms. On the other hand, cities like Amsterdam, The Netherlands, figured out that they don’t have to blindly expect the (voluntary) support of a platform like Airbnb. It is time for them to take matters in their own hands. Whether consciously or unconsciously, Airbnb has surely started an interesting discussion. The New Uber Model: Best or Most Foolish Choice Ever? Is the discussion on the gig economy still on-topic?